Concentrix Solar GmbH is a start-up company that was created to develop a technology that uses concentrating modules which focus sunlight on high-performance photovoltaic (PV) cells, which in turn convert the solar energy into electricity. Concentrix has begun delivery of a series of pilot units to analyze the technology’s commercial viability. In parallel the company is establishing an automated production line to manufacture the modules. The company’s target market is large-scale plants located in the sunniest regions of the world. The technology, called FLATCON®, uses glass Fresnel lenses to focus direct sunlight on a a 2mm-diameter focal point on a solar cell. By concentrating the sunlight by a factor of 500, the active portion of the solar cell surface is reduced to a mere fraction of that required in conventional solar panels. This results in significantly less material consumption and therefore lower production costs. This process permits the use of more expensive, high-quality cells which offer better efficiency because of their favorable thermodynamic properties. The efficiency rate can be increased by using dual or triple cell technology. This involves stacking two or three cells made from different semiconductor materials on top of one another. Each of the three cells is sensitized to a specific portion of the solar spectrum. This approach can lead to an efficiency rate of more than 35%. The semiconductor materials are synthesized using elements from the 3rd and 5th group (III-V) of the periodic table (galliumarsenid and germanium). III-V solar cells are produced in a single process. The FLATCON® technology does not require active cooling which results in a very reliable system with low maintenance costs. The module technology, using mainly glass for the housing, is very resistant to harsh environments and it is a potentially low cost solution. The modules employ a dual axis sun tracking system. Concentrix believes that the future of the photovoltaics industry lies in the deployment of large power generating plants with capacities ranging from 100 kilowatt to 1 megawatt and greater. The primary market for the FLATCON® technology is state-of-the-art photovoltaic facilities located in regions with high levels of solar radiation. 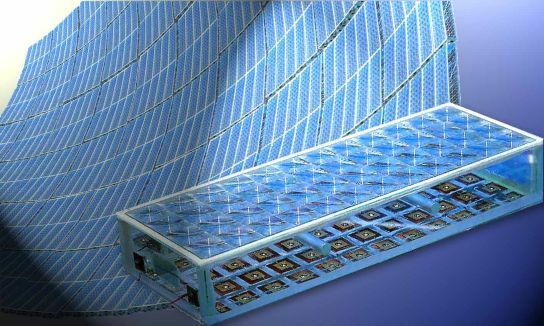 The company’s is moving their technology into production by establishing an automated production line for the manufacture of concentrator PV modules. Concentrix will begin operating its first production line in midyear 2006. In parallel, demonstration plants are being built based on initial prototypes. They have already begun delivering these plants to strategic partners. Commercial availability of concentrating photovoltaic power plants is scheduled for early 2007. They determined that the energy payback time of the system would be below one year. In their paper presented at the International Conference on Solar Concentrators for the Generation of Electricity or Hydrogen they reported on a thorough analysis of production cost that was carried out for a 20 MW production line. This paper compares the levelized electricity costs (LEC) of their modules in comparison to conventional flat plate PV modules. This comparison was performed with regard to the LEC which is determined by the annual depreciation for the initial investment into the PV power plant, the operating and maintenance costs (O&M) and the annual energy output. They used a system price of US$3.00/Wp (2.5 €/Wp) for the FLATCON® System and a US$3.70/Wp (3.1 €/Wp) system price for flat-plate PV. The LEC calculations showed that for sites with moderate solar resources like Munich, Freiburg or Paris the flat-plate system is superior, whereas at sites with high direct solar radiation the FLATCON® technology is expected to have an advantage over flat-plate systems: 15% lower LEC for good sites in Spain and 20% for sites in Arizona or northern Africa. Concentrix has completed the first round of venture capital financing in order to fund its expansion. The financing was provided by Good Energies, a strategic investor in the solar photovoltaics industry. The FLATCON® technology was developed at the Fraunhofer Institute for Solar Energy Systems in Freiburg Germany. Concentrix Solar GmbH was founded in early 2005 as a spin-off of the Fraunhofer ISE. With a staff of around 400 employees, the Fraunhofer ISE is Europe’s largest solar research institute and boasts more than 15 years experience in the solar industry with a focus on photovoltaic technologies. Ningbo Juncheng Industrial Group Co.,Ltd is a professional exporter and manufacturer, located in Ningbo,China. the equipment from dozens of watt to million of watt. Welcome to vist our website ( www.raizenter.com ) and if you have any questiones,pls feel free to contact us.